Q: Where are your shelters located? A: FBMS operates two shelters for individual adults age 18+. Both shelters operate 24 hours per day, 365 days per year. FBMS also operates shelters for families throughout the region. Families in need of shelter must be referred through the Department of Housing and Community Development. Q: What is the procedure to get into the shelter? A: Father Bill’s Place, Quincy, and MainSpring House, Brockton is open to any individual adult, age 18+, who originates from our service area (proof of connection to service area required). Guests not originating from our service area may stay for up to 3 days as you make arrangements for shelter or other services in your area of origin. Guests may bring 2 bags. Intake begins at 4:30 p.m. and ends at 6:00 p.m. daily. During intake, belongings are searched to ensure safety of all guests; medications and electronics (including cell phones) are locked and made available as needed; beds are assigned; and guests are given towels. Guests must depart the building by 7:30 a.m. each morning, unless inclement weather dictates a “stay-in” day, which will be announced by staff that morning. Guests are served a hot dinner and a continental breakfast. Lunch is also available and open to the community from 11: 30 a.m. to 1:00 p.m. 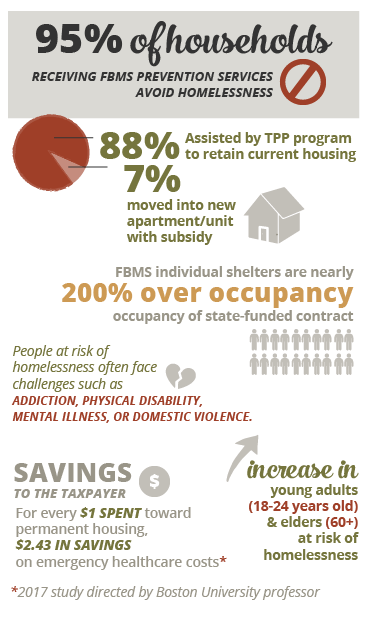 Families in need of shelter must be referred through the Department of Housing and Community Development. For more information on how to access family shelter, visit our Get Help page. Q: What type of proof is sufficient to prove connection to a town in the service area? A: The following forms of identification are sufficient in proving a tie to our service area: state issued License/ID card; school transcript; utility bill; eviction notice. Magazine subscriptions or letters from friends are generally not accepted. If there is a question about the documentation, staff will assess the ties on a case by case basis. Q: What are the sleeping arrangements at the shelter? A: Father Bill’s Place and MainSpring House both have separate dorm areas for men and women. During times of increased capacity, mats are set up in other areas of the shelter. Q: Will a bed be available for me? A: FBMS vows to never turn anyone away. Guests are assigned beds on a first-come, first-serve basis. During times of increased capacity, mats are set up in other areas of the shelter. Bed preference is given to veterans, as well as individuals actively engaged with a triage worker, who helps guests develop a service plan intended to secure permanent housing. Q: Is it a wet/dry shelter? A: Father Bill’s Place and MainSpring House are both considered “damp” shelters. This means if an individual is under the influence of substances, but are not deemed a risk to oneself or to others, that individual is able to stay at the shelter. Q: What if I am a young adult? 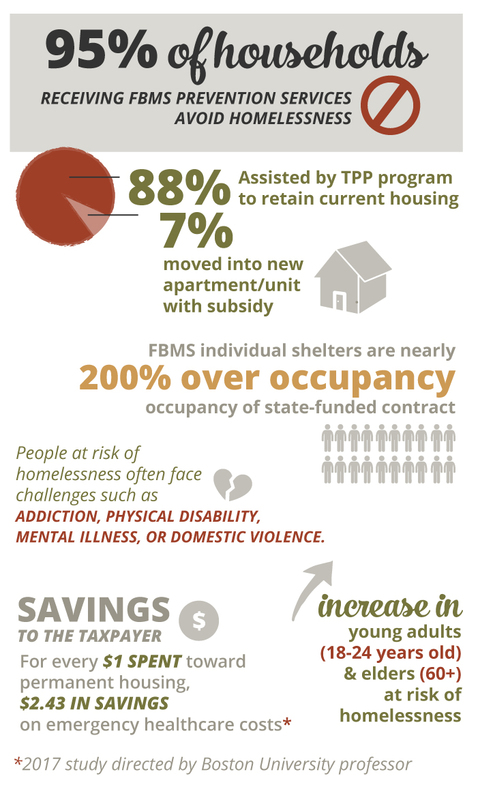 A: The shelter program at FBMS has a youth protocol for guests between the ages of 18-24. For those under the age of 18 looking for assistance, you may contact Bridge Over Troubled Water in Boston (617) 423-9575, or School on Wheels (508) 587-9091. Families with children under 18 in need of shelter must be referred through the Department of Housing and Community Development. For more information, visit our GET HELP page. Q: I am looking for a family member or friend who may be staying at your shelter or actively engaged in one of your programs; can you help? A: To protect the privacy of our participants, we are unable to disclose any personal information, even the fact that your family member is staying with us. In some situations, we are able pass along information with no guarantee the message is received by the intended individual. You can also contact the police and ask that they contact us. Q: What if I am a veteran? A: We have dedicated staff and programs to work with veterans struggling with homelessness. If you’re a veteran in need of services, please either email veterans@helpfbms.org or call 508-492-6448, to find out how we may be able to help you. A: Both shelters (in Quincy and Brockton) host lunch for anyone in need in the community. 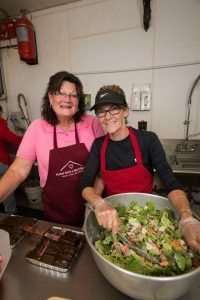 Father Bill’s Place hosts a community lunch seven days per week, between the hours of 11:30 a.m. and 1 p.m. At MainSpring House, The Table community lunch, is open 6 days per week (closed Tuesday), from 10 a.m. to 2 p.m., with several seatings available. FBMS also provides a Thanksgiving community meals in Quincy and Brockton. Please visit our website in November if you will be in need of a Thanksgiving meal. Q: Can FBMS help me acquire housing? A: If you are an individual at risk of homelessness or are currently homeless and in need of housing, Father Bill’s & MainSpring may be able to provide prevention and housing resources. We are generally able to assist individuals who originate from our service area. Please call our Housing Information Hotline at 508-586-2348 to find out how we may be able to assist you. Q: What kinds of donations does FBMS accept? A: All donations are greatly appreciated and the best way to support FBMS is with a monetary donation, that we are able to direct to areas of greatest need. Donations made by check, cash, or credit card allows us to respond immediately in helping friends and neighbors in need. 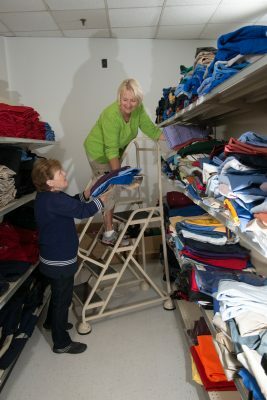 We also rely on donations of in-kind goods to help offset the cost of purchasing items. Download our Wishlist form for a list of current needs and visit our Give Page for information on how you can organize friends, family, co-workers, or other groups to run a drive. You may also visit our Amazon wish list page to order items needed for our shelter guests and housing participants that can be shipped directly to us. We are part of the Amazon Smile program, so when you shop for any Amazon order through that link, a percentage of your total is donated to FBMS. Q: Do you accept donations of food? A: We accept donations of food in large quantities which allows us to serve upwards of 500 meals each day at our shelters. The following food items best help us serve those in need and ensure safe and efficient kitchen operations: Number (#) 10 commercial-sized canned goods; coffee; packaged meats; whole fruits and vegetables; bread, pasta, cereal (commercial-sized); diary; juice; snacks – chips, nuts, granola bars (by the case); desserts – cookies, cakes, pies. All food must be clearly marked with proper, viable usage dates. 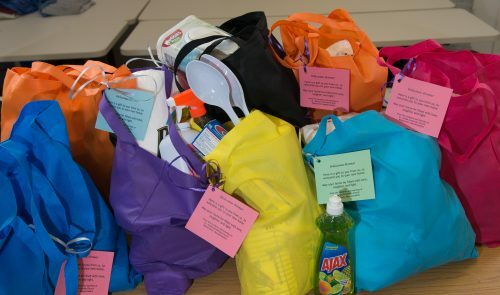 Bagged lunches are also welcomed and accepted at our shelters, and are a great way for groups (particularly youth groups) to be involved in helping those served by FBMS. For more information on bagged lunches visit our Get Involved page. Q: How much of my donation goes to the people you serve? A: We are proud of the fact that 88 cents of every dollar raised goes directly to our programs and services, ensuring that your charitable investment has the most impact. Directly related is our commitment to maintaining a high level of transparency so supporters are aware of what their contributions are supporting. Therefore, Father Bill’s & MainSpring has been given the highest level rating as a Platinum participant on Guidestar, the world’s largest source of information on nonprofit organizations. Q: What donations do you not accept and why? A: Due to hygiene and safety concerns, we are unable to accept the following items: expired food or trays of food that have been previously served; small canned goods (but your local food pantry will); items that have been recalled, banned or do not meet current safety standards; baby or infant car seats; furniture; used clothing; any toys or children’s items that can pose a choking hazard or safety risk. FBMS works closely with local partners and other nonprofits to ensure all donations are used as effectively as possible. If we are unable to accept certain donations, we will gladly suggest an appropriate place to donate. Due to resource constraints, we are unable to pick up donations. Q: Where can I drop my donations? A: Donations can be dropped at our Administrative Offices (430 Belmont Street, Brockton), which houses our Distribution Center, Monday through Friday 8:00 a.m. to 4:30 p.m. It is always beneficial to notify the Development office in advance of your drop off. You may arrange this by calling 508-427-6448 or emailing info@helpfbms.org. Q: What if I am unable to drop off my donation during business hours? Q: How do I get my name removed from your mailing list? A: FBMS adheres to the wishes of all households who request to receive limited mailings or request removal from our mailing list. To make this request, either contact the Development office at 508-427-6448 or email info@helpfbms.org. Please note that the more information we receive, the better we are able to ensure your request is honored. There may be occasions when a mailing will cross in the mail with your request. Q: How can I become a volunteer at FBMS? A: Please visit our Volunteer Page for information on how you can become a volunteer. Q: Do you offer court mandated volunteer service hours? A: FBMS is not able to provide court mandated volunteer hours. Below are organizations in the area that can accommodate these requests. Q: Do you provide community services hours for individuals under the age of 18? A: Volunteer opportunities located at any of our program sites are geared toward those age 18+. On a case-by-case basis we can accommodate younger volunteers at our Distribution Center or Administrative Offices. There are several other ways that those of all ages can volunteer your time and support those we serve, particularly by running drives for essential items or by preparing and donating bagged lunches. Q: What volunteer opportunities do you have for groups? A: FBMS offers a variety of options for groups to volunteer within our programs. Please visit our Volunteer Page for information on how your group can volunteer with FBMS. Father Bill’s & MainSpring welcomes the opportunity to speak with local groups about issues related to homelessness and about our work. We have a diversity of staff, participants and presentations available to help raise awareness about homelessness. Our staff is skilled in speaking about our work with various groups including, but not limited to: business/civic groups, religious organizations, and school-aged children ranging from elementary through college. We work with each group to tailor a presentation to meet their needs, ensuring it is both informative and suitable for that particular audience. Often times, presentations are made in conjunction with a drive for items, which helps give hands on involvement with our mission. Click here to read the City of Brockton’s Draft FY2018-FY2022 Consolidated Plan for Housing & Community Development.